Founded in 1993 by journalist John Wallach, Seeds of Peace is dedicated to empowering young leaders from regions of conflict with the leadership skills required to advance reconciliation and coexistence. Over the last 17 years, Seeds of Peace has intensified its impact, dramatically increasing the number of participants, represented nations and programs. 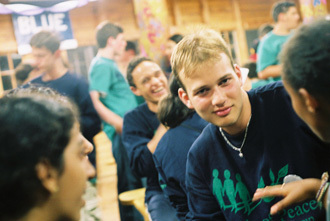 From 46 Israeli, Palestinian and Egyptian teenagers in 1993, the organization has expanded its programming to include young leaders from South Asia, Cyprus and the Balkans. Its leadership network now encompasses over 4,000 young people. Currently, the organization is actively working in the Middle East and South Asia. Seeds of Peace's internationally-recognized program model begins at its summer Camp in Maine and continues through programming in regions around the world with innovative initiatives in the form of conferences, regional workshops, educational and professional opportunities, and an adult educators program. This comprehensive system allows participants to develop empathy, respect, and confidence as well as leadership, communication and negotiation skills—all critical components that will facilitate peaceful coexistence for the next generation. © 2010 merge:media, inc. all rights reserved.